Maxillaria variabilis is a small orchid that occurs in a range of colors and has a long period of blooming. 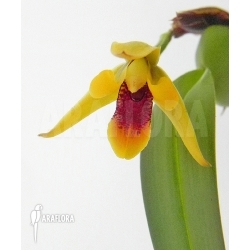 Araflora has a yellow-darkred Maxillaria variabilis in it's selection, that is suitable for a wide range of temperatures. Read more about Maxillaria variabilis below the photo's under 'product info' and 'plant care'. The Maxillaria variabilis is found in the rain forests from Mexico up to Ecuador, where the orchid is capable of growing on earth, trees and rocks. Because the orchid is found at a great range of altitudes, it is capable of withstanding varied temperatures, between 14 and 30 degrees Celsius. The flowers can be yellow or chestnut and every color in between. The shape of the flower resembles the jaws of insects, which explains the name 'Maxillaria' (literally meaning 'jaw'). Flowers are 1 to 1,5 cm big. The narrow leafs can grow to be 15 to 25 cm tall. Place Maxillaria variabilis in a pot or hanging basket with a soil mix suitable for orchids. It is also possible to attach the flower to a piece of tree bark or Vern root. 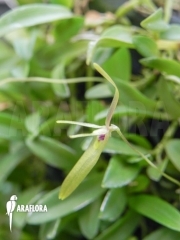 Araflora offers a special orchid mix, based on pine tree bark, see 'pine bark course' (orchid bark). The space that the orchid inhabits, should have a high humidity and nightly temperatures between 14 to 30 degrees Celsius. The orchid requires moderate shadow en plenty of water, especially during the growing season.